Enough with the shinny balls already! 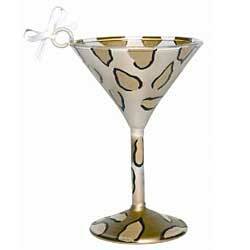 What your Christmas tree needs this year is a few Leopard print martini ornaments to loosen up. Celebrate the holidays and delight your guests with our Mini-tini Ornament. Adorned with a pearl white ribbon, these ornaments will look great on your Christmas tree. Each ornament comes with a hang tag and is elegantly gift boxed for storage and gift-giving. Available in various designs. Each sold separately.